Data Tracker is a computer-based electronic data collection tool designed for researchers and clinicians measuring behavior in real-time. It is designed to easily accomodate situation where complex, simultaneous forms of behavior need to be recorded. This program calculations measures of agreement, provides a range of reports, visualizes on-going data recording, and outputs behavioral measurements in a range of formats. ► Internet access, for installation and updates. The Data Tracker program collects a range of behavioral data and incoming data can be viewed and interpreted in a range of ways. Between-session visual analysis can be performed by selected which types of behavior to display and aggregating those types of behavior accordingly. Data Tracker provides within-subject methods for interpreting behavioral data in real-time. These types of analyses assist in the interpretation how behavior takes places in the context other, alternative behavior of interest. Within-session figures can be viewed for recorded sessions as well as provided post-session, as desired. 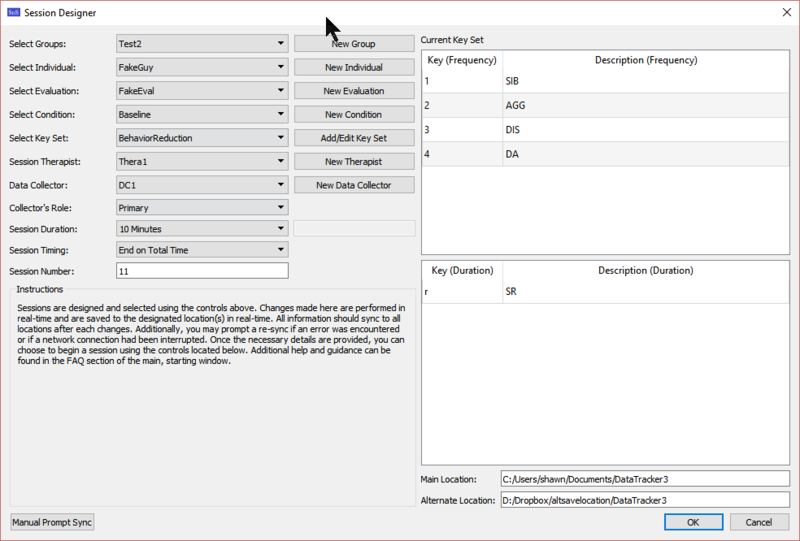 The Data Tracker program allows for users to design a range of experiments/treatment conditions. Support is provided for rate/duration-based targets and the measurements provided can accomodate multiple schedules as well. At present, up to three reinforcement schedules can be accomodated concurrently.